We’ve said it before, and we’ll say it again: if there is one thing Yamaha does and does well, it is making small displacement engines that hit well above their weight class. 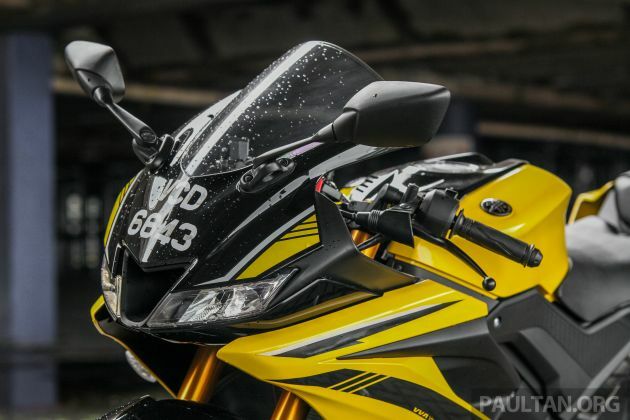 A case in point is the 2019 Yamaha YZF-R15, its sports bike offering for the 150 cc market and priced at RM11,988. In the 150 cc market segment, Yamaha offers two other alternatives, albeit in the scooter side of things. These are the sporty Yamaha NVX 155 – which made it to our “Bike of the Year” list in 2017 and the slightly more conservative Yamaha NMax 155. 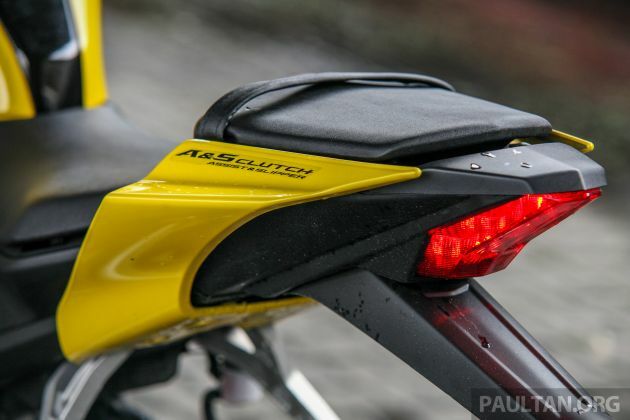 Does the Malaysian market need a third 150 cc offering – third national car project notwithstanding? Well, for the YZF-R15, it addresses a market gap last filled by the Honda CBR150 and Kawasaki KIPS – something a little faster than the run of the mill kapchai and targetted to the young rider who wants a sporty bike with full-fairing that looks the business. The business is, of course, looking like you’re going at warp speed while waiting for the lights to turn green on Dataran Merdeka. 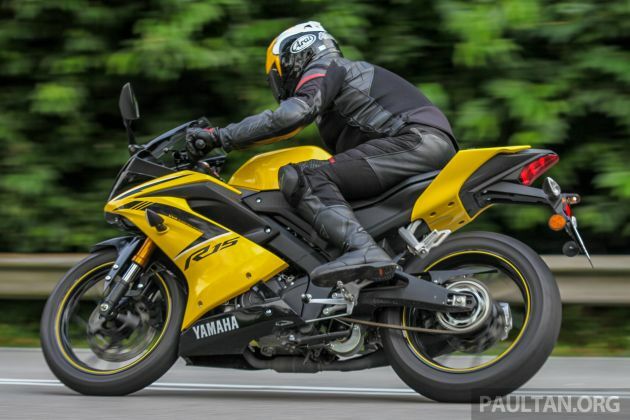 But there is not a lot lacking in the performance of the YZF-R15, as we were to find out. Handing us the key to the YZF-R15, Yamaha’s technical person said to the author, “let me know what you think, I think you will like this engine.” Bearing Yamaha’s racing heritage, especially with 250 cc two-strokes, in mind, we set off on the YZF-R15 to find out what was what with the baby YZF. At the first approach, the YZF-R15 is a stylish looking thing, following the design cues of the bigger machines in the YZF range, notably the YZF-R1 and YZF-R6. The fuel tank, having a capacity of 11-litres which is as standard as these things go, is clad in a faux air intake cover, a design cue taken from the YZF-R1. 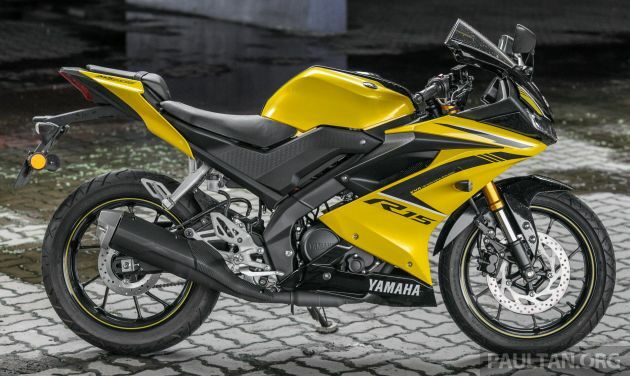 Swinging a leg over the two-piece saddle, again, like the bigger, racier bikes in Yamaha’s YZF range, the rider will be slightly surprised to find the saddle height set at 830 mm. This is normal for a track machine, not so usual for a bike intended for daily road riding, notably in Asia. 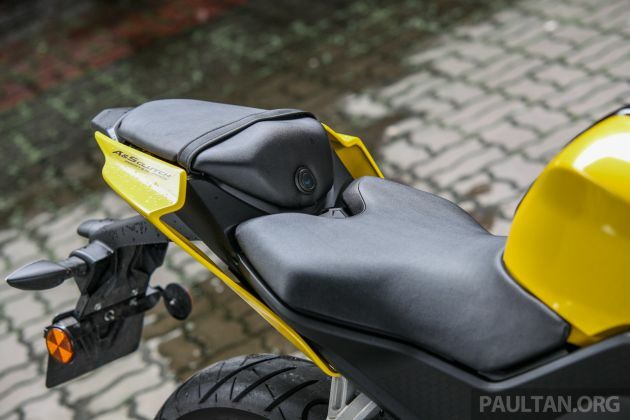 Seat height aside – you won’t have a problem if you’re 168 cm taller or more – the seating position itself is a little extreme if you don’t have a lot of experience with pure race motorcycles. The bend of the clip on handlebars along with the seat/handlebar relationship is very much biased for high speed track use. This means the rider is placed into a racing crouch on the R15, with elbows bent and back arched over the tank. While this might be great for attacking corners, it does mean the rider is in the neck bent position required of racing machines. Starting the YZF-R15 brings the 155 cc, liquid-cooled single-cylinder to life with a distinctive thump. Coming with SOHC and variable valve actuation (VVA), the R15 claims an output of 19 hp at 10,000 rpm and a torque number of 14.2 Nm at 8,500 rpm. The engine on the R15 is common with the Yamaha Nmax and NVX 155 scooters as mentioned earlier, but there are a few differences. Aside from the omission of Yamaha’s Blue Core engine design philosophy which reduces emissions, the R15’s mill has been tuned to deliver slightly more power and in a linear fashion. VVA kicks in at about 7,000 rpm, allowing for a swift build to the torque peak of 8,500 rpm and a little above that. The engine starts running out of steam at about 9,200 rpm, and pushing the single above that would be cruel and unusual punishment. We found the YZF-R15 good for about 135 km/h on the open highway. Crouched well down with chin on the tank and elbows out of the breeze, it will deliver more than that but be careful picking fights with Vivas and Myvis. Setting off on the R15, the clutch pull is light, helped by the assist and slipper clutch. While some might ask why an engine this small might need a slipper clutch, a single mis-shift mid-corner on a wet road will change your mind, and quickly. Clicking the six-speed gearbox through the cogs, we found engagement to be precise and positive, with a very definite point felt where the dog slips each gear into place. Lever throw was moderate and we had no issues riding the R15 whether wearing street shoes or riding boots. No false neutrals were evident during our time with the R15, though it remains to be seen whether the gearbox holds up to hard use and redline gear changes. Which is about the only way to ride the YZF-R15. Designed as it is for the young rider coming up from the underbone class, or the fresh licence holder, the R15’s engine needs to be wound out hard. As the R15 screams through the gears, you will find acceleration is best when the revs are kept up, as befits the displacement of the engine. 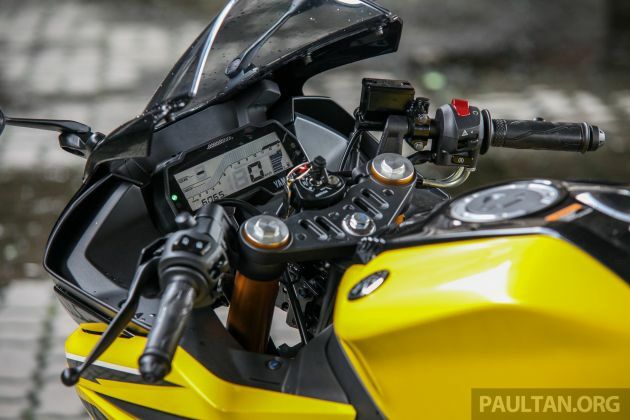 It is at this point, after rowing frantically through the gears with the throttle pinned to the stop, you run into the R15’s top speed of… well… enough. It is faster than the NVX 155 and the NMax, we will say that much, enough to keep you moving at a pace faster than highway traffic, but just stay out of the fast lane. Riding the YZF-R15 around, we found it to be a physically small bike, notably in the area of rider accommodation. The seat distance is just enough for the rider to get into a tuck and that’s about it. Those are the limitations of the R15, in that it is basically designed for 18-year old crotch rocket jockeys and not plus-sized senior riders, but what is it like to ride? Well, for one thing, handling on the R15 is on the sporty side of acceptable. Throwing the bike into corners revealed that the upside-down forks in front performed well, if a little on the low side in terms of compression damping. At the back, the monoshock performed acceptably, showing a bit of weave and bob in high speed sweepers. In terms of tracking, the YZF-R15 proved to be stable at highway speeds with no sign of weaving. Be cautious overtaking bigger vehicles though, especially when entering the backwash, as the R15’s 137 kg wet weight did not do much to keep the bike planted in strong side winds. The YZF-R15 performed best doing quick riding in town, the sharp handling making weaving around cars on surface roads easy. That Yamaha did not cut corners in the handling stakes, despite the budget pricing of the R15, is shown in the Deltabox frame and the cast and welded aluminium swingarm. This goes some way to explaining the performance intentions of the YZF-R15’s riding position and VVA engine. 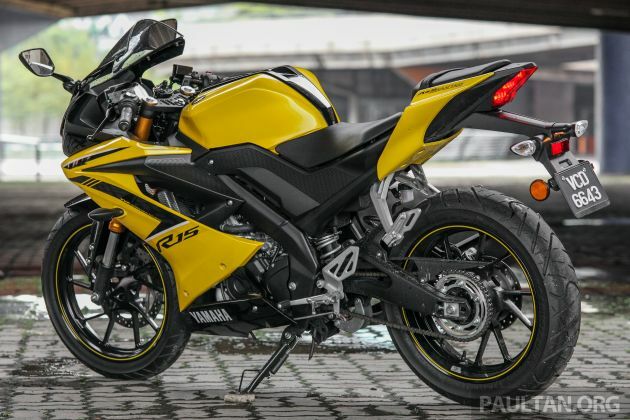 We expect to see quite a number of R15’s being raced in its home market of Indonesia next year. Tyre sizing also goes towards displaying the racing intent of the YZF-R15, with a huge (for a 150) 140/70-17 tyre at the back end. It carries a 100/80-17 in front, which will make finding performance rubber for the R15 a breeze since the OEM fitment IRC rubber lack definite feedback and grip when pushed to the edge. 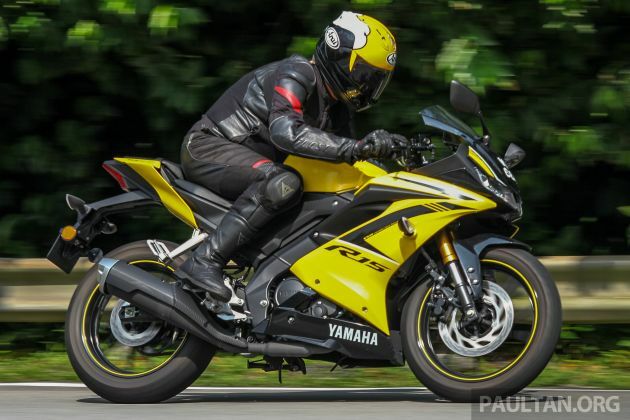 What we did like about the YZF-R15 is its overall road-going performance. While we did notice a lot of buzziness in the R15, that is the nature of business for a single-cylinder sports machine, and it did not give a lot away in terms of acceleration. Overtaking did need downshifting a couple of gears, especially if the rider is in a hurry, but if leisurely acceleration is acceptable, the R15 would happily chug along in fifth gear. Much to our surprise, sixth is not an overdrive that lowered engine revs, instead giving a few more km/h in speed. Not a highway cruiser then, or making any sort of pretence to long-distance comfort. This is a sports bike through and through and designed to charge through corners, riding a slingshot out the other side. When charging into corners, the front 282 mm diameter disc proved up to the task, and the feedback and bite from the brake lever was almost at superbike level. A gentle caress of two fingers on the lever and the R15 slowed without fuss. If more braking was needed, the rear brake was brought into play, but we rarely found a need to do so, except when really gunning it for corners on our usual test loop up the mountain and down again. In any case, after several hard corners with lots of downshifting and full-handed grabbing of the front lever, we noticed the lever coming back to the bars slightly more, but there was no deterioration in braking performance. What we did note is the frugality of the YZF-R15 – not surprising really, given the engine capacity. Riding around town, we got a best of 2.5 litres per 100 km while highway riding returned even better numbers at 1.9 litres per 100 km. Inside the cockpit a premium touch – for this market segment – is the monochrome LCD panel that displays all the necessary information the rider needs. Complemented by LED lighting front and rear, the panel includes a gear indicator and average fuel consumption, features usually found in higher end motorcycle instrument displays. 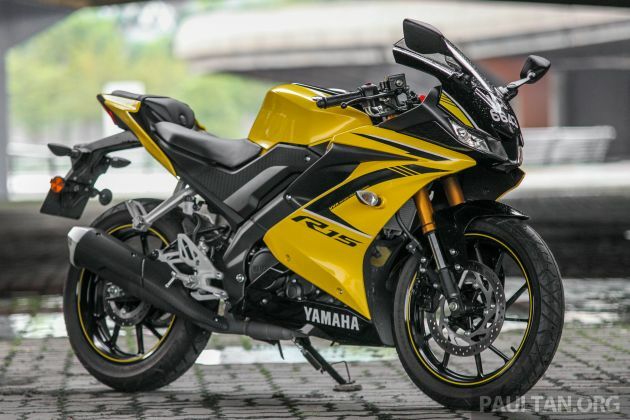 So, who needs a 2019 Yamaha YZF-R15, at RM11,988 excluding road tax, insurance and registration. Well, aside from the lack of ABS, which we did not really expect at this price point, the YZF-R15 is positioned as a sports bike. One thing is for sure, the YZF-R15 will teach the rider a lot about making the most of the power available. Carrying corner speed is paramount on the R15, and conservation of energy, or in this case, forward momentum and cornering lines, will be lessons hard learnt. This means the intended market is the young rider with a fresh licence. Or a senior rider who wishes he was 17 again, hanging outside the convent school gate waiting for his girlfriend to show up. Either way, it’s one well worth considering. topping off at 135kmph is a tad slow. it’s not good enough to keep up with traffic if this bike is use for interstate i.e KL to Penang. It goes a bit faster than that but the Head of Editorial won’t let me publish the figure. is the abs version ever coming to Malaysia? any idea? Seriously, if you are thinking interstate, then you need to work up to a bigger bike. Speed is not the real issue on interstate. Weight is. You are going to get blown all over the place with this. The faster you go, the worst it would be. Better write up from you this time, no more comparing tiny bikes with superbikes like before. Congrats! Bunyi macam ribut, lari macam siput. Better feedback fr real owner…..real figure on top speed dat we need to compare at the like kawa 250 single cylinder just 10kmh gap but drunk lower fuel wt few $ saving can by demak dj90…..I like. Please understand what is the meaning of overdrive. For this bike the 5th and 6th gear is actually both overdrive ratios. To understand better.. A ratio of overdrive 1:1 can be also called direct drive. Anything that is be 1.000 will be known as overdrive. 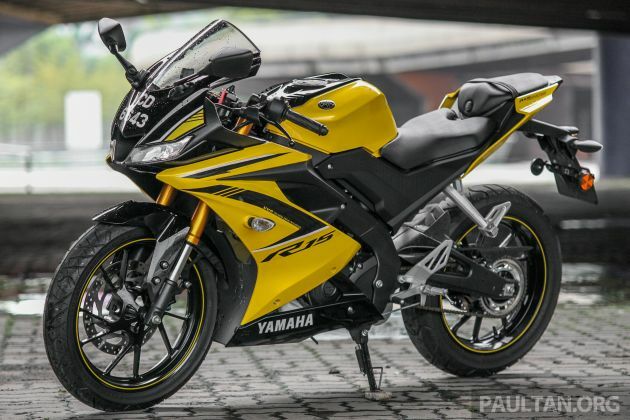 I wonder what Honda and Kawasaki will answer with this Yamaha challenge..
is the abs version ever coming to Malaysia? any one knows?